With its high-performance networks and data centers, Deutsche Telekom is arguably Europe’s leading ICT-services provider, writes the German telecoms group, whose services range from drone protection to cybersecurity. For most people, a drone is just a toy that enables them to explore the world from above. Companies such as Lufthansa see things differently. In August 2016, an Airbus pilot on approach to Munich airport discovered a drone just ten meters from his right wing-tip. This all took place about 1,000 meters above the ground, and shows how drones can become dangerous – and this applies to companies, too. Deutsche Telekom offers a comprehensive drone protection system for its customers. “We started by getting an overview of known drone attacks in the private sector and against the police and military,” says project manager Markus Piendl, the security technology expert leading Deutsche Telekom’s efforts against this new threat from the skies. “Many national and international companies and authorities helped by explaining incidents that had come to their attention. The spectrum was huge. The attacks, some of which were professionally executed, targeted critical infrastructure or involved breaches of privacy, sabotage, economic espionage or extortion,” Piendl continues. He reports that these drone encroachments had very unpleasant consequences for many of those affected. In one case, a company even went bankrupt because of successful industrial espionage using drones. 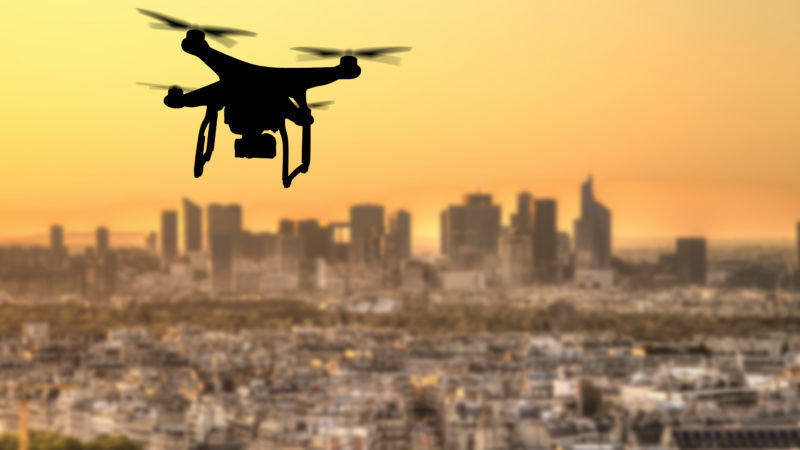 Drones are therefore a real issue for corporate security, just as much as the security of the IT infrastructure and data. Dangers for business have increased enormously. Deutsche Telekom is now registering nearly six million cyber attacks on its network infrastructures and IT systems every day. Networked systems are vulnerable and not secure. With its high-performance networks and data centers, Deutsche Telekom is arguably Europe’s leading ICT-services provider. In keeping with this position, it feels an obligation to protect its customers’ data and processes, and its own IT assets, around the globe. For this reason, Deutsche Telekom pools its expertise in the Telekom Security unit. The security services it offers include comprehensive end-to-end solutions, including business solutions for companies of all sizes (from SMEs to large corporations) and solutions for consumers. Telekom Security’s security services and solutions are offered globally – in connection with networks comprising data and security center worldwide. Deutsche Telekom operates Shared Security Operations Centers (SOCs) in Hungary, the Slovak Republic, Germany, Mexico and South Africa. Other dedicated SOCs are based in Germany. One example of international collaboration is the partnership with AlienVault. Software from AlienVault and special services from Deutsche Telekom have been combined to create a security solution known as “Cyberdefense for SMEs” (“Cyberdefense für den Mittelstand”). This solution collects security findings from various core systems and applications and looks for suspicious activities. Based on this analysis, measures can be undertaken and there can be a further investigation of whether there really have been any attacks. In the field of cloud-based Internet security – an important growth area – Telekom Security has introduced Internet Protect Pro (IPP), which it is developing in collaboration with ZScaler, an established market leader in the area of cloud-based Security-as-a-Service (SaaS). IPP imposes no special hardware or software requirements on customers, and can be delivered worldwide, meaning it can quite easily be integrated by T-Systems’ international customers. Another area of corporate security is the new “Magenta Anti-Drone Shield”, which focuses on detection and thus involves collaboration with the industry and technological leader Dedrone. This start-up company has developed “DroneTracker”, which detects drones using various integrated sensors such as video cameras, frequency scanners and microphones. It is based on intelligent software that can reliably distinguish drones from birds, helicopters, and other flying objects. The modular system can be integrated into existing security concepts and can utilize almost any number of sensors from different manufacturers. “We were particularly impressed by the DroneTracker MultiSensor hardware and the RF sensor,” says Piendl. In addition, there is also the software’s highly praised positional display and interfaces to third-party providers. In addition to its approach using Dedrone, Deutsche Telekom also works with components from experts such as Rhode & Schwarz, Squarehead, Robin Radar and HP Wüst. Consequently, Piendl says the ‘Magenta Anti-Drone Shield’ toolkit currently offers the best detection, “regardless of whether radio, optical, acoustic, or radar-based detection is required”.